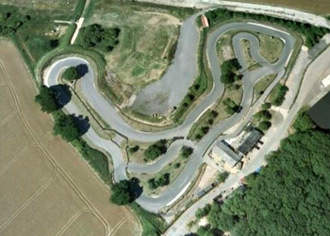 Very popular East Midlands kart circuit that offers both karting and paintball. One of the few places we know of that has a bar! Head southwest on Vaughan Way/A594 toward Highcross Street and keep right at the fork. Continue to follow A594, keep right at the fork and continue to follow Welford Road. Turn left on to Victoria Park Road/B568 and at the roundabout take the third exit onto London Road/A6. Turn left onto Stoughton Road/A6030 and continue to follow A6030, at the roundabout take the second exit onto Gartree Road/B582, continue to follow Gartree Road, go through two roundabouts - Destination will be on the right. A 75-minute team endurance event. Qualifying to determine your grid position then a non-stop 75-minute relay event for teams of 3 drivers sharing a kart. Three x 10 Minute heats, 20 Minute final, 10 Minute B final, Trophy for winner and medals for 2nd and 3rd places. Bottle of bubbly for fastest lap.